The South Fork of the American River is the premier rafting river in California and one of the most popular rivers in the United States. Located in the heart of the Sierra Foothills smack in the middle of Gold Rush Country, the South Fork of the American is a great way for families, friends, and nervous first timers to be introduced to the thrills and fun of whitewater rafting in a safe yet exhilarating environment. Enjoy the fun and excitement of rafting with your kids or a group of friends in the outdoors while creating wonderful memories of time spent together on the river. Ideally located, the 21 mile South Fork of the American River offers a Class 3 rafting experience with over 30 exhilarating rapids and a great deal of fun and enjoyment. Whether this will be your first time or you are a whitewater veteran, the South Fork will provide an exciting and thrilling adventure. The South Fork of the American River is an easy to moderate intensity Class 3 rafting river and is a great way for everyone from ages 6 to 106 to experience the fun of whitewater rafting. 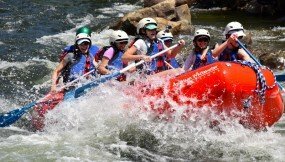 Perfect for families and friends, corporate groups, scout groups and school groups to nervous first timers, a South Fork rafting adventure has the ability to bring out huge smiles on of all your faces. Enjoy the relaxation of floating down a river with moments of sheer excitement as you paddle through fun filled rapids. It’s a perfect river to bring together just the right level of excitement. We offer 5 different rafting experiences for South Fork American River rafting ranging from a half day to multi day trips covering between 6 to 21 miles. You can also combine any one of our South Fork rafting experiences with a Middle Fork or North Fork rafting trip for a truly exhilarating and unforgettable multi-day rafting adventure. ***Water Notice 2017*** Water flows on the South Fork American River result from releases from hydroelectric facilities located upstream. Such water releases are not subject to the control of El Dorado County or commercial rafting companies operating under permits from the County of El Dorado. When to go rafting on the South Fork? The season for rafting the South Fork of the American River starts at the beginning of April and goes until the end of September. We are able to raft on weekends in October. In April and early May the water runs strong and typically slightly higher than in the summer. Spring rafting on the South Fork of the American River is a fantastic experience for those looking for a slightly more exciting run! Early May through the end of September the dams on the South Fork offer a stable, yet exciting and fun flow of water all summer long. Where is the South Fork located? The South Fork of the American River is located in the historic Gold Rush town of Coloma, just a short drive northeast of Sacramento or southwest of Reno/Tahoe and an easy 2 hour drive from the Bay Area depending on traffic. When you go rafting on the American River with us, you have several trip meeting options. Option 1: Stay at our deluxe campground in the Historic Gold Rush town of Coloma the night before your trip. Your camping the night before is free! If you are doing a multi-day trip then camping for several nights is included. Option 2: Meet at our campground the morning of your trip. A great option if you live close by and are just coming for a day of rafting fun on the South Fork. Check out the South Fork American River virtual tour with a rapid-by-rapid description. The El Dorado County Visitors Authority has an excellent site with lots of information about the South Fork of the American River and the surrounding area. There is also a South Fork American River Access Map for people interested in exploring the South Fork American River. You can also look at current and historic South Fork Flows. For more questions on our South Fork Trips or questions in general, please call us at 800-825-3205 or check out our FAQ page.